This post isn't what you might be thinking it will be. If you want a sob story post of the older sister who is wallowing in depression with her three baby brothers getting married before her, well, wrong stop here. =) This is a post of so much hope and happiness that I'm thinking a little of the love might just rub off onto y'all after reading it! I've been sitting on this post for EVER (I was waiting til all three were engaged because, well, that just would make it quite legit) and am so excited to finally share it! It has actually been something on my heart for years. Call it sister intuition, or whatever, but for so long already I have expected to have my younger siblings get married first. Probably partially because they were always mature for their ages, whereas it took me a little longer to grow up, and then partially just because I really thought it would end out this way. It never bothered me; on the contrary, I was ecstatic for it. I prayed for it. For the last several years, in particular (as they've been getting older) it has been one of the greatest cries of my heart---for my brothers to find and have peace about the right girl with which to spend the rest of their lives. I was totally thrilled with the thought that they would probably "go" before me. It didn't bother me in the slightest, rather, it was my chief wish and dream that my brothers would get married first. At the time I started more seriously praying for them (in my early twenties, when they were getting to the age where they could get married) I knew that there were no guys I was interested in, and at the time I honestly had no desire to get married, with other things in my life that I was focusing on. The thought of wanting my brothers to wait until I was ready and married first, never even crossed my mind. And here we are. The boys all started relationships in the fall of 2016, (Mitchell in August, Josh in September, and Carson in October) and now all three of them are getting married this fall, 2017. It was all so God, the timing of everything. Recently a friend told us that a rumor is going around our home community that my Dad "finally allowed his boys to get married". That story got the loudest howls of laughter you can imagine, around our dinner table! Without going into the whole long stories of their lives the past five years, let me just tell you that the reason my brothers are all getting married now, virtually at the same time, has nothing to do with planning it all perfectly, or the timing being just what they would've picked, or any of that. For everyone of you who knows their stories, and for me, their oldest sister, we can only say, "the hand of Jesus was all over those stories, and the timing was perfect, because it was ALL JESUS." Last fall, when all of this was beginning, Allison was living in Mexico, and I was at home, trying to keep all three of these brother lovebirds on the straight and narrow, haha. And you know what? It was, and continues to be, one of the happiest times of my life. I vividly remember one October Sunday, when all three girlfriends were over for dinner. I texted Allison pictures and said something like this: "Sister of mine...from my place at the kitchen window, washing dishes, I can faintly hear Mitchell + Bryn chatting in the schoolroom, I see Josh and Cassidy swinging and talking on the swings in the front yard, and Carson and Carolina are deep in conversation, still at the dinner table, the only ones left there. ALLI! God is so good! I might just sit down and cry from sheer happiness! How are we so blessed? So much answered prayer! So much grace and beauty poured down from Jesus!!" I felt like I should have some big response thought out, but all I wanted to say, every time, was, "How could I be anything but happy at so much answered prayer? At so much beautiful young love? At so much joy? How could I be anything BUT the happiest girl in the world when Jesus gives such good gifts to my best friends---these brothers of mine?" All these questions, and this constant expectation for my sister and I to be knee-deep in depression over the situation, got me to thinking about something. 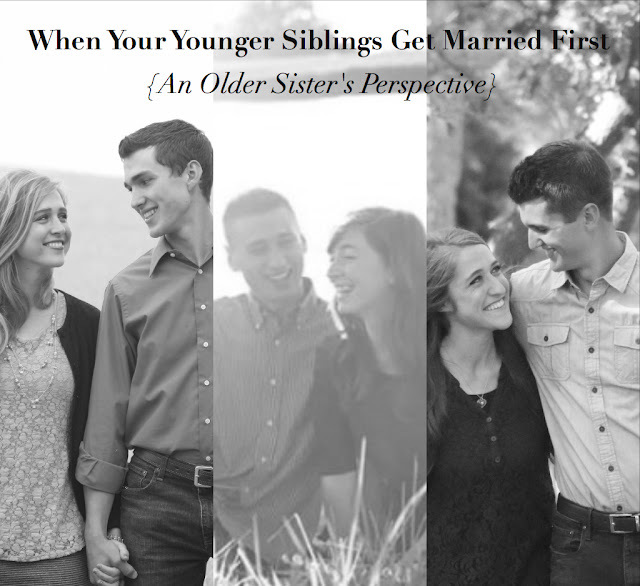 A) Why is it expected to be hard for an older sister if her younger siblings get married first? B) Why do we allow those expectations to be the norm? C) What needs to happen for them NOT to be the norm? And as such, I have a few thoughts that I'd like to share from my heart, to whoever is reading this. The first thing that comes to my mind as a foundation for setting a new "normal" is close-knit sibling relationships. If your siblings are your best friends, your closest confidants, your greatest blessing...than why would you feel anything but joy for them when God brings along their life partner? The second is the answering of prayer. When there is something that has been such a big part of your heart and life and prayer list for so long (aka godly girls for the brothers) your first thought, when God answers, is "glory hallelujah!" Am I right? After all, this is how we respond to every other answered prayer, so why not the same to this one? The third thing I think of, is a subject I have touched on before, and will continue to talk about in the future, and that is joy in the current journey. When you find joy right where God has you, and desire God's perfect best + timing for all of your life (marriage just being a drop in the bucket of God's gifts) and the lives of those you love, then when He answers those prayers and brings your favorite people together, it is so amazing. Why do we put God in such a box? Why do we think everything has to happen in order? Why do we think it is fair, and right, and "how it should be", for kids to get married in age order? It is so bizarre, if you actually think about it, and it basically never happens that way anyway! My answer to this is that I think we put God in this box of "our perfect timing" because we think we know best. We think that we know how it all should be. I really have no idea why we think this; in every other area of our lives we would say God knows best. (at least I'd hope we would!) So why not in this area of one of the most important decisions of our lives? Why wouldn't God know best on this one, too? And if we know He knows best, why would we not be absolutely delighted with His timing and plan? Not only for us, but for all of the people we love, also? Regardless of age. Honestly, age has nothing to do with it. If people could just get that idea out of the way, it would be a much better world. (can I get an amen from from the single readers here?) One of my beautiful sister-in-laws-to-be is nineteen. I could not be happier for her and my brother. She is an absolute gem, and one of my heroes. God's perfect time for her to get married is now, when she is young! I sure wasn't ready when I was nineteen, and I'm relieved that I didn't get married then, because if I would've it would've been disaster. But that was me. It wasn't God's time for me then. It is God's time for her now. See, it is all about timing and following the Spirit, and nothing about age or situation. Yes, my brothers are getting married first. Yes, as most people think and say, we "went" (as in relationship/marriage timing) topsy turvy and all "out of order". Yes, it has been the most wild and beautiful past nine months that you could imagine. Yes, it is going to be an incredible fall. Hey, not just every girl gets to gain three sisters within 24 hours!! Talk about party time, overtime! (cue all the confetti + heart eyes) I still can't believe it! No, it isn't hard, and no, it isn't a struggle. God has answered my prayers and given my brothers these gifts-these three incredible women-that I prayed for. It is the most beautiful thing to watch God answer prayer in such exceedingly abundant ways. My heart is filled with so much happiness! Please feel free to share this post wherever, simply linking back to my blog. I feel very passionately that this is a subject that needs to be talked about in our generation! And as always, I would love to hear from y'all. Thoughts, questions, comments? Leave them below! What you say makes so much sense. Why do we trust God with everything except for the important things? Sometimes we need to just step back and let go. I guess the bigger things (like marriage & children) are the things we have a hard time trusting God with because we especially want control of them. What we don't always realize is that the bigger it is, the more important it is to hand the controls over to God. Thanks so much for sharing and congrats on three more sisters!!! Amen, sista! You are a beautiful inspiration of living the single years to the FULLEST! Love how you've embraced your single season and been so thrilled for others getting married first. You pray for and encourage Godly marriage so well. Love this so much! Thank you for sharing!!! Amen!This is definitely my favorite post you've done so far. Thank you!!! Thanks Chelsey! You and Allison have written this at precisely the right time. I have no younger siblings getting married, but several close friends are. I've struggled this year as having my own family has been my primary goal. Thanks again (and you too Allison)! 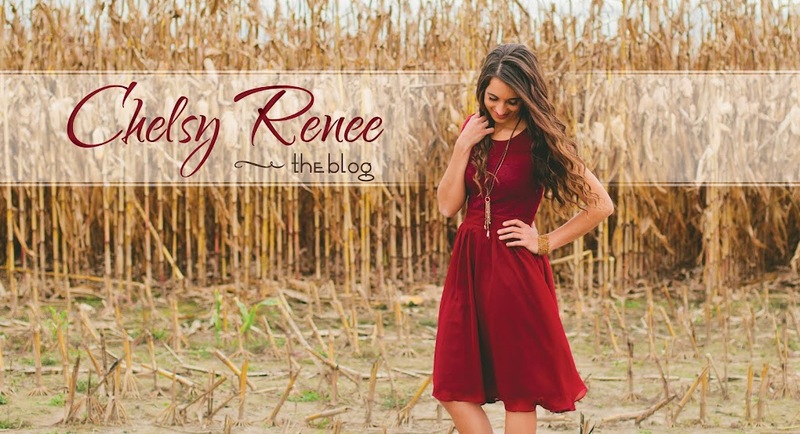 Such an encouraging, insightful post, thanks sweet girl! What are you looking forward the most for their weddings besides the marriages? Amen, BTW, and you always seem to keep a smile on my face when I read your entries. Thanks and God bless! BTW, have any of the gals in your family read "Before You Meet Prince Charming"? I would suggest you all to read it if you are interested. :) Most of the points you wrote are in the godly book. Thanks! Yes, I read it back in my teens. The author is a good friend of mine. =) Great book! Oh, how cool Sarah Mally is your friend! I have used that book to reach out to my lost friends and others. It has been such an encouragement to me and my girl friends! Amen, Chelsy! I love this whole post! Wow so exciting�� So will it be a triple wedding? Carson + Josh are marrying sisters, so the four of them decided they would rather get married all together in a double wedding, rather than several months apart, because more of their friends/family will be able to come to both, this way. And Mitchell + his girlfriend decided that since the other boys are getting married on a Friday, they will get married Saturday, the following day, so that most of the guests can stay over and attend all the weddings. It will be a little crazy, but the boys have been planning/discussing it for quite a while already, and because they all want big weddings and as many friends/family as possible to be able to attend, this will make it a lot easier on all the out-of-state guests. Chelsey, Do you recomend reading Before you meet Prince charming? Yes, it is a great book! I read it when I was in my teens and it was very helpful. Just as a little encouragement, I heard this quote a few years back and it is super simple but so so good. "It's better to be single and wish you were married...than to be married and wish you were single." and B) Surround yourself with opportunities to meet and get to know other singles. That B is pretty controversial, and something I'm thinking about doing a blog post on. I'm not saying you need to help God out. I'm just saying that its one thing to be older and not be married and to know its just not been God's timing yet. It is a whole different business to be older and genuinely not know any good guys. I don't know you at all so I can safely say all this without knowing your story or what is happening in your life! All I would say is just to make sure you are happy single (because if you aren't happy single you won't be happy married) and to make sure that you aren't hiding out waiting for a guy to come to your doorstep. Just want to encourage you to stay focused on God and use this time to love on your married (and engaged) siblings and support them all you can in this season God has for them! It is no better than your season, just a different one! I don't know your name but I'm praying for you! How perfectly and beautifully gracious! P.S. See you in only 63 days!! Counting the daaays!! Cannot wait!! Miss you! A few months back I stumbled upon your blog and read the belle sleeve post and was so encouraged. Later I wanted to come back and read other posts, but couldn't remember your blog link! I saw your blog url in the KBR magazine and am so happy to have visited here once again. Your posts were a blessing to me. Just what I needed to hear today. Thank you for sharing. The joy you have in the Lord is so inspiring to me. Your blog is now bookmarked and I can't wait to read more!